When you have a big job, you need the toughest grader blade on the market. 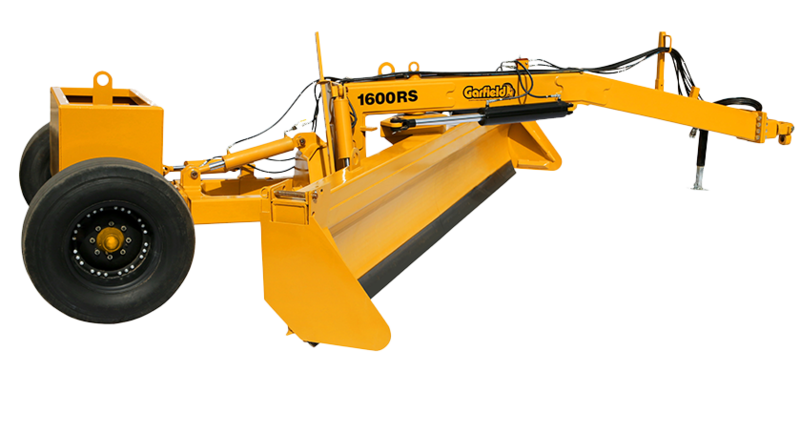 The Garfield Grader Blade comes in 4 widths from 10' to 16'. All models have a Hydraulic Rear Steer which allows the operator to move the blade 4 feet more to the left or the right side of the tractor hydraulically from the tractor seat. The Rear Steer feature allows the Rear Steer grader to clean along feedlot fences, buildings, road edges, trees, etc. without having to drive the tractor so close to the objects that you are working near. The standard rear steer offset gives the Grader the capability to clean out irrigation and drainage ditches that are wet, while keeping the tractor on drier ground, but most importantly, together with the massive weight, it allows you to counter side draft. All models come standard with fold down sides, turning your grader into a box scraper, which allows you to carry more material. IN/Depth of cut 6" 6" 10" 10"
IN/Ground clearance 0-25" 0-25" 0-30" 0-30"
IN/Overall height 39" 39" 54.5" 54.5"
FT/Overall length 19'6" 19'6" 21'5" 21'5"